MYTH: Domestic violence does not affect many Americans. FACT: A woman is beaten every 15 seconds in the United States. Countless more are emotionally abused, sexually coerced, and controlled financially. MYTH: Battering is only a momentary loss of temper. FACT: If batterers were truly out of control, as many claim to be during violent incidents, there would be many more domestic violence homicides. In fact, many batterers do “control” their violence, abusing their victims in less visible places on their bodies, such as under the hairline or on the torso. Furthermore, researchers have found that domestic violence often occurs in cycles, and every episode is preceded by a predictable, repeated pattern of behavior and decisions made by the batterer. FACT: Obviously some batterers experience stress, but stress does not cause abuse. Many men under severe stress do not batter. In violent relationships, even when stress is reduced, the violence will continue or eventually resume because the batterer still feels entitled to assault his partner. MYTH: Drugs and alcohol cause the violence. FACT: Although there is a high correlation between alcohol, or other substance abuse, and battering, it is not a causal relationship. Batterers use drinking as one of many excuses for their violence and as a way to place the responsibility for their violence elsewhere. Stopping the abusers’ drinking will not stop the violence. Both battering and substance abuse need to be addressed separately, as overlapping yet independent problems. MYTH: Battered women provoke the violence. FACT: Any woman can find herself battered. The victim is not at fault but rather the batterer, the partner who has committed the violence. No one can be responsible for another person’s deliberate choices and actions. Domestic violence victims, however, frequently hear comments from their abusers like, “I did it for your own good,” or from outsiders, “you must have really made him mad.” These statements can confuse a victim and lead her to take responsibility for the violence or blame herself. No matter what, domestic violence is not the victim’s fault. 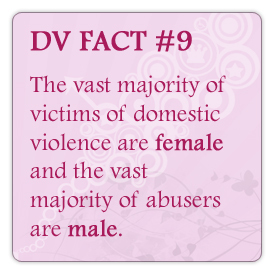 MYTH: Only women are victims of domestic violence. 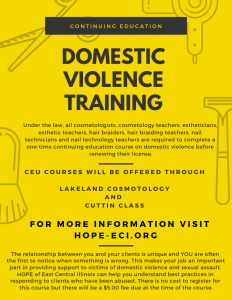 FACT: Approximately 95% of those battered are women; however, in a small number of cases, women are the batterers and their male partners, the victims. MYTH: The problem is couples assaulting each other. FACT: A well-publicized study conducted by Dr. Murray Strauss at the University of New Hampshire found that women use violent means to resolve conflict in relationships as often as men. However, the study also concluded that when the context and consequences of an assault are measured, the majority of victims are women. The U.S. Department of Justice has found that 95% of the victims of spouse abuse are female. Men can be victims, but it is rare. MYTH: Domestic violence occurs only in poor, uneducated, and racially marked families. FACT: Women of all classes, cultures, religions, races, occupations, and ages are battered by husbands, lovers, boyfriends, and partners. The fact that lower income victims and abusers are over-represented in calls to police, battered women’s shelters, and social services may be due to a lack of other resources. MYTH: Domestic violence is a push, a slap, or a punch and does not produce serious injuries. FACT: Battered women are often severely injured and even murdered. Between 22% and 35% of women who visit emergency rooms are there for injuries related to ongoing partner abuse. MYTH: It is easy for a battered woman to leave her abuser. FACT: Women who leave their abuser are at 75% greater risk of being killed by the abuser than those who stay. Nationally, 50% of homeless women and children are on the street because of violence in their home. MYTH: Domestic violence does not affect children. FACT: Child abuse occurs in up to 70% of the homes where domestic violence occurs. When a parent is victimized by domestic violence, children are abused at a rate 15 times the national average. MYTH: After a woman leaves an abusive partner, the abuse stops. FACT: Separated women are three times more likely than divorced women, and 25 times more likely than married women living with their husbands, to be victimized by a batterer. Batterers frequently take advantage of court-ordered visitation to inflict harm on their former partners and their children. MYTH: Batterers who seek custody do so out of love for their children and a desire to be good parents. FACT: Custody litigation frequently becomes a vehicle whereby batterers attempt to extend or maintain their control and authority over the abused parent after separation. Fathers who battered the mother are twice as likely to seek sole physical custody for their children than are non-violent fathers. MYTH: Allegations of child abuse increase significantly in divorce and custody disputes; women frequently fabricate allegations of abuse to hurt their former partner or to gain an advantage in custody disputes. FACT: Allegations of child sexual abuse are rare, occurring in only 2-3% of all divorce cases and fewer than 10% of custody cases. Less than 1/2 of all allegations of abuse against fathers are made by the child’s mother, most are made by third parties. Allegations of child sexual abuse are not more likely to be false when made during custody/divorce proceedings than when made at other times.